As I've mentioned before, a lot of my creative background is in painting. I'm thoroughly enjoying seeing all the ways that painting and quilting and similar. From time to time I am hoping to post some tips and thoughts about topics visual artists study in depth that are just as important for creating "wow" quilts. One of the keys to both a good painting and a good quilt is having a full range of tonal value in one's quilts. I had not given this a whole lot of thought until I took my first formal oil painting class two years ago. I vividly remember Larry repeating, "Your darks aren't dark enough! Stop touching the darks!" In Larry's mind, over-blending, muddying your darks and lights into a puddle of medium tones, is basically a cardinal sin. And it takes all the zing out of a work. It's like that with quilts, too. When we're anxious about the result, we tend to hover in the middle of the gray-scale where it feels safe, avoiding both lights and darks. Mid-tone quilts, however, are going to appear nice, but flat. Only true contrasts will make a quilt dazzling. We talk about this when we choose colors, about complementary colors and such (more on that another day! :-) ), but we need complementing and contrasting value as well. But let's back up a bit. The beginning is a very good place to start. This scale also shows how there's really more than three mid-range colors. I would say that there's 2-3 lights, 2-3 darks, and 4-6 mid-range values on this scale. What I mean by that is that the third color from the left would read as a lovely light if the darkest color in the quilt is the color on the far right. But if the darkest value on the quilt is the second or third from the right, the lightest color needs to be much closer to white to read as sufficiently light to create good contrast. Moda Mini Charms-- These might become my new addiction! Now, let's look at this in fabric, shall we? We'll use two recent lines from Moda, one that's a grayscale line to begin with, Modern Background-Ink by Zen Chic, and a popular color line, Little Ruby, by Bonnie and Camille. We'll start with Modern Backgrounds- Ink. This pack is pretty straight-forward as it arrived arranged by grayscale. Now, if you were actually making a black and white quilt with this line, I would strongly encourage you to select a few white and gray and white on white prints to include, as I personally think your quilt would benefit from a bit more contrast than what is given here. But, for our purposes, we'll work exclusively with this collection. Above, you see the whole line with the lightest gray on the far left and the blacks on the far right. there is a strong contrast between the lightest and darkest tones. But what happens if we remove those two strong contrast sections? On the left you see the lightest and darkest values of this collection. On the right is the mid-range of the collection. A quilt made from only these middle values is going to look flat and muddy. See how much more "pop" there is when we add those contrasting values back in in a gray scale composed from this line? Gray scale made from Modern Backgrounds- Ink fabrics. Hopefully this first exercise helps translate the idea of a gray scale from the page or palette to fabric. But how do we achieve successful contrast when working with fabric lines in color? I'm going to step you through my process using the entire Little Ruby line. Obviously you will probably only be working with the entire line if you are using precuts (unless you're me and just bought a half-yard of every single fabric in Gingiber's Thicket line... #obsessed). So, if you are working with precuts, you may want to consider buying a little extra of the lightest and darkest values of a line or coordinating solids that match the lightest and darkest values because the majority of every line falls within that mid-range. Thus, without buying a little extra of the lightest lights and darkest darks, your quilt will still look dominantly mid-range (and thus flatter and less "wow") even though those higher contrast values are technically present. So, let's get started! When I'm arranging a patterned collection by value, I start by spreading all the fabric out on a white background. You can see at the bottom I started arranging the fabrics that were clearly the lights and darks. But all those others, the ones that make up the middle of the scale, they are nearly impossible to get right without a little help. Here you see that I arranged the colors as closely as I could to a gray scale in various chunks. Then, I take a picture on my iPhone, apply the "Mono" filter, and voila! It's so much easier to see where on the scale those mid-range values fall. I'm likely to never get it perfect, but I can certainly get a lot closer! Ta da! I don't know about y'all, but when I looked at this line straight out of the pack, I expected those turquoise fabrics to fall a lot further to the left in the "light" zone. Notice that they're pretty solidly in the mid-range. That's not to say you couldn't use them as a light, but you'd have to be sure to put a good bit of those few deep red fabrics in with it to emphasize the contrast. A quilt just of the turquoises, pinks, and greens of this line is not going to have a lot of change in value. One last comparison, and then I'll show a couple quilts to illustrate all of this "in real life." Low volume print (almost all the same print), pulled from along the scale. This method provided high contrast. But having all the same print isn't usually the effect we're going for. Larger print (again, almost all the same). 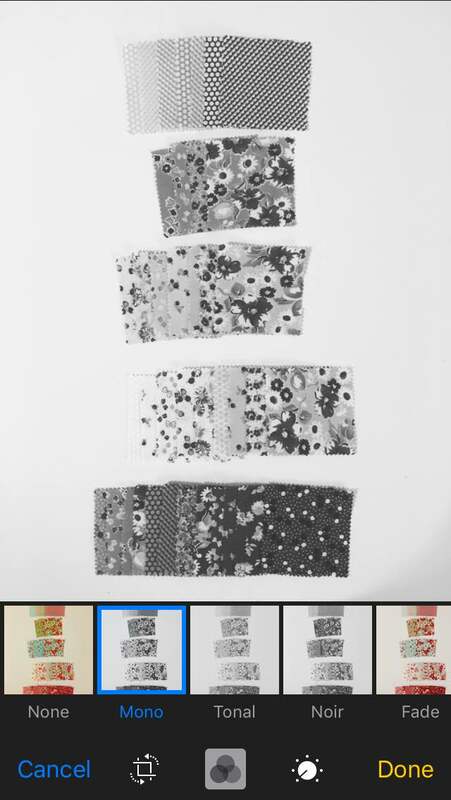 Not only does the print look repetitive this time, but it's hard to see a clear contrast in value, even though each of these fabrics were pulled from roughly equidistant points on the scale just like the first selection. A variety of prints pulled from along the scale. This selection is the most visually interesting. In a quilt made from this selection, the red would likely "win" the show, but it would be surrounded by a beautifully complementary collection of values and prints. If you wanted to emphasize a different color, even one from the mid-range of values, I would recommend choosing the large scale print in that color and a low-volume red instead. You would still achieve successful contrast, but you would increase the "pop" of your star color by choosing the more "wow" print for that selection. For some "real life" examples, here's few of the quilts in my studio now. Vintage Quilt Top- I bought this quilt top at an antique store a couple of weeks ago. I'm totally in love with it, but there's not a whole lot of change in value. While this quilt is made from scraps and strings, I'd consider it a pretty good example of what is likely to happen if one uses precuts of a line without adding extra lights and darks. There ARE lights and darks, but the mid-range dominates the quilt. Murmuration- While this quilt also has a "gray" area in the middle where the birds and colors are transitioning, there is clear change in value across the quilt. This change is emphasized by the borders which are made of the lightest and darkest values. This quilt also shows how contrast can be created with color (strongest here with the teal and hot pink). Of course you want contrast of both color and value for maximum effect! Scarecrow in the Sun, in progress. I have about 25% of this quilt up on the design wall so far. you can see that I have clear lightest and darkest tones. What I will want to be careful of, however, is having to great a stretch of those lightest tones in the middle without sticking some of the darkest color nearby. This quilt will also be heavily quilted and embroidered, and I plan to use thread to add additional contrast and interest. I hope this helps you understand the importance of color value contrast in quilting! I'd love to see what you're working on and how you use value in your quilts or other works of art-- be sure to give me a follow and a shout on Instagram @stringandstory!